So I have done alot since I last blogged. We made it to the airport in Phuket on time and got to Bangkok. We had a good Biggs rest with some good food in my cousins home. The next day we got up and chilled our then wet to meet out tour group in the Bangkok central hotel which is so nice. Everyone on our tour is quite young which is good, there are 15 of us and out guide kakada. That night we all wet for dinner together then on to the ooh San road. The next day we Were on the bus for the long journey into Cambodia. We all got out visas and throughout with no problems. We finished in Siem Reap where we had dinner at a locals home. We were outside and had to sit on the ground which was authentic and she made the best food and so much of it too!!! 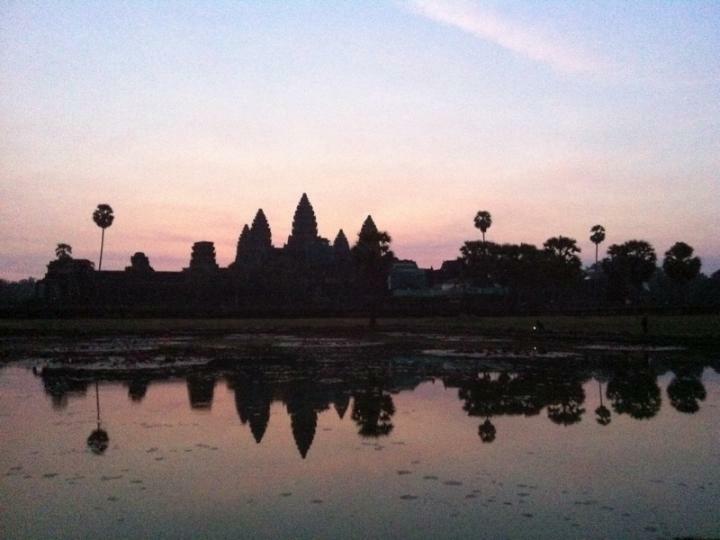 The next day we were up at 4:30 am to get the bus to Angkor Wat temple to watch the sunrise, not the photo! It was beautiful and there were so many people too. We went back to the hotel for breakfast then a snooze before we were off again back to 4 different temples. The first was the jungle temple that was in tomb raider another was Angkor Wat itself and another 2. After this we headed to the floating village to watch the sunset. There is alot of poverty here which is sad. That night we went to a hotel where they do a buffet meal and a show of traditional Cambodian dancers, I went up 3 times for food! The dancers were also very good. We went to the Market and then out for drinks later... A very long day. The next day we went by local bus to Phnom Penh. The next day we went to Tuol Sleng (s21) prison and the killing fields which was pretty horrendous. So sad. That night our tour guide invited us to dinner at his home where he has a school to teach English. We went to talk to the kids so they could practice. I was talking to the tour guides daughter who was ten and sooo good at English it was scary considering she had only been learning for a year. The food was unbelieveable... So tasty!! But they made way too much. After dinner they brought out a traditional drink which you take as a shot. It is rice wine but there are tarantulas in the bottom of the bottle and ge made them himself!!! I took one of the shots tryin to ignore the fact that spiders were in the bottle. It was very sting kind of like tequila but with no salt or lemon to help! After we took one of the spiders out and took photos with it, I was so creeped out with eventually did it.. It was dead by the way. The next day we were up early again to get the public bus to Sihanoukville by the beach. A little camodian girl became my friend and I let her play games on my phone and nintendo ds, she was good at English too!! One we arrived we just chilled out by the pool. That night we went for dinner that night and had a BBQ, it was so good. We had some cocktails too and then headed out for some karaoke and dancing. The next day we had a boat trip to 3 islands where we did swimming, fishing and sunbathing. I got a little burnt because we were playing piggy in the middle in the sea but with loads of people, not so easy when you are 5ft 2.5inches. We got back and just rested the rest of the night. I went to bed early. Today we were up early again and are now on our way into vietnam! Very exciting.